Happy Sunday! Happy Monday already to some of you! Today our imaginary couple Wilfred and Verneta are enjoying mimosas on their patio as the first act in a day-long celebration of Vern's 58th birthday. Willie reaches between the folds of his newspaper and slides a card across the glass-top table while Verneta is looking down, petting Tops. As Verneta lifted her auburn head, her gaze fell upon Willie's card in its ivory linen envelope with her name scrawled across the front in his illegal handwriting. She picked up the card and for several minutes held it lovingly, running her hands across the silken finish and, finally, against her cheek which had become flush from the morning sun and the mimosa. "Oh, Wilf," sighed Vern. Wilfred had never been happier than he was at that moment, watching the joy light up Verneta's continence. He made a mental note to give his housekeeper a little something extra in her next check. What a bonus that she not only did windows, she made delightful little homemade cards designed to his exact personal specifelicitations. 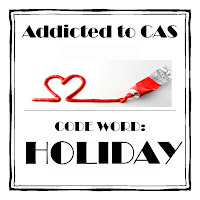 Addicted to CAS (ATCAS) #20 "Holiday." My card reflects the "on vacation" definition of the code word. 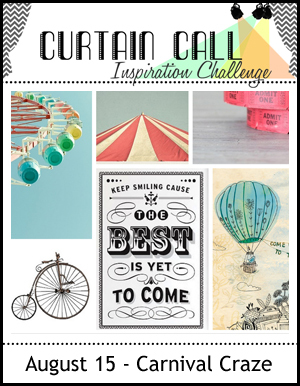 Curtain Call Inspiration Challege "Carnival Craze." My card focuses on the "Keep Sailing" verse. Willie and Vern will be sailing off on a Carnival cruise! 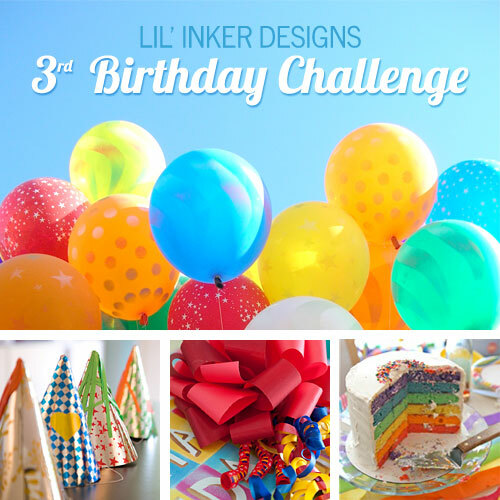 Lil' Inker Designs 3rd Birthday Challenge and Celebration. Congratulations to Lil' Inker!! I've used their wonderful products on my cards before, but this is my first time joining in one the challenges! 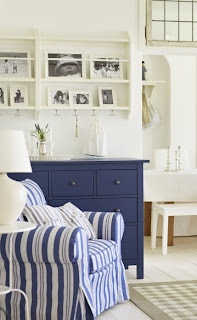 Moxie Fab World Tuesday Trigger Challenge: "I'm Craving Navy." 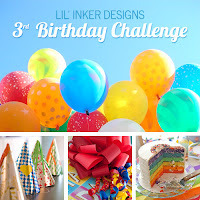 As always, many of the challenges I enter have awesome sponsors and prizes, so I hope you will click on the links for the details, meet the fab Design Teams and Guest Designers, be amazed by their inspiration cards, and join in these fun challenges! NBUS #38 ~ In my own ongoing challenge to use up my "never-before-used schtuff," today's NBUS are the image and sediments from the Technique Tuesday stamp set "R&R." I don't think I've used the summer starfruit paper before, but I'm not sure. I have seen negative comments about the color, but it's quite striking IRL against the midnight muse and white. I originally had the image framed in the navy and starfruit mats against the white card base, but in one of those moments we have, I started playing with putting the cutout back into the negative frame and I really liked how it looked. The card itself is an example of how you can use a colored card base and still have a CAS card with lots of "white space." (Thanks, Chrissie.) I colored the wooden anchor charm with a SU! midnight muse marker. As always, thank you for coming by to visit the Playhouse and special thanks to you if you take the time to leave a comment and/or join as a follower! Dies: Li'l Inker "Stitched Rectangles"
I love the colour combination and the fun story to go along with the card. We went on a cruise once through the Panama Canal visiting lots of countries along the way - oh it seems a far distant memory now - sigh! A great story and what a wonderful card! Wow, look at all those challenges, good luck on them, as always it looks like a winner to me !!! Wilfred and Verneta sound like very charming imaginary people... Imaginary friends encouraging people to make cards are far more civilised than the ones that just want to get people into trouble! lol. Lovely card. Super layout and I love the simplicity of the colour scheme! So very effective when it works, which in this case it really does! Way to use a colored base! Looks so fun with the navy~ Thanks for joining in at ATCAS! How fun! That image is so graphic it reminds me of a vintage ad for a cruise! I really like the yellow highlights throughout - it really ties it all together! Thank you for your suggestions Darnell. Fun story and great card . Very art deco I thought! I love the bold color & CAS image! So fun and love those stamps...makes me want to hop on a ship and grab a drink, right??? will you join me? So fun. LOVE the story. Have you ever thought of writing a novel? I'm just wondering, are you going on a cruise? I absolutely love cruising. The last one was along the California coast (Los Angeles, Santa Barbara, San Diego, San Francisco). The card is perfect, by the way. You are such a delight.so fun to read your blog, so entertaining! Are you really going on a cruise? You should, and I think I should be going to Hawaii (see my post for this challenge!!). Are you a writer? If not, you certainly should be!!! I was so caught up in your wonderful story, that I had to back track to see your absolutely AMAZING card :-) The cruise ship is so cool, and I love that you added the anchor! Thank you for making me day, Darnell! And, by the way, I hope your hubby has a cruise in store for you this year...you deserve it! Now, open Word and finish this wonderful story...please? What a great story, brought a tear to my eye and a big awhhhhhh. I love that color, right up my alley with avocado green, great image, simple and elegant card, thanks for sharing, it's always a pleasure to visit, you always make me smile big, have a wonderful week..
What a great card, Darnell! I love the image, the colors, the piercing, everything! And especially the story of Vern and Willie! Great card and I just LOVED reading your story! You should write a book!!! Very fun story and the perfect card to accompany it!! I agree...you should be writing a book...love your cruise card...those great stitched mats and that beautiful cruise ship. I sure would love to be heading off on a cruise right now although I am certain I would be a few pounds heavier if I were! Yes write a book Darnell. You completely captivated me with your story, blew me away with your card and way to rock out so many challenges girl! Thank you for all your good wishes for my anniversary--MWAH! Love your card! OMGosh it's so perfect! fabulous card! (didn't expect anything else! Smile! Your story to go with it is just wonderful! I enjoyed it very much...starts my week off with a smile. I've not been a fan of the Summer Starfruit but I love how you've used it! I'll remember to use it with navy! The anchor is delightful and I love how you've put the die cut back in. The story is perfect! Oh mý Dippy, this is Georgeous......oh no, sorry his name is Wilfred! That Vernetta is one lucky lady, not only on a promise of a cruise........but she's got a housekeeper!!! lol Fabulous card - just love that front-on image of a liner and the colours are amazing together. You're totally right about using colour and still being CAS. Thanks so much for joining us for this challenge at A2CAS. I love the story as much as the card Darnell! You are so talented! I was feeling all *humprey and grumpfrey* today, having come home from visiting my family, but your post has brightened my day and altered my mood (for now!)! My hand is up with all the others voting for you to write a book! Yes, please!! Love the carnival cruise story, and the card is the perfect X perfect fit for the challenges! Thanks for the laugh and the eye-candy! Oh my word Darnell - what can I say that hasn't already been said!! You are an amazingly talented lady, and I will definitely buy your first novel 'cos I know it will be brilliant!! As for the card - fabulous CAS retro image, stunning colour combination, and the anchor completes the design perfectly. Love it! What a joy your little story is--I agree, you definitely need to do more writing! Love your card! The colors really are quite striking and the ship is such a fabby image. I also thought of a 30s' poster when I first say your beautiful card! I really like it!! Cute twist with the Carnival Cruise them :) Thanks for playing along with us at the Curtain Call. 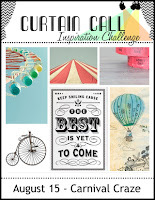 What an awesome combination of challenges...love the carnival cruise idea. What an engaging story. . . Totally AGREE with the previous comments, you're a great writer! LOVE this cruise card! FAB colors and the inside sentiment is Super! Oh, you funny and talented lady! You give me laughter every time you post! I love your card- so clean and crisp and eye-catching! Praying for your ticker on Thursday! Love the card. Love the story more. Your stories make me smile and laugh like a loon every time! Love the card. Fabulous! I'm always a sucker for a clean and simple nautical card. I love this CAS card Darnell! Great job! Thanks for playing along at Curtain Call!